We already know that posture is key in overall health, confidence, physical performance, and injury prevention. But good posture is difficult to achieve and maintain, especially if you haven’t developed good posture habits. The good news is that there are a lot of posture training systems out there to help you strengthen your posture and get on the path to good posture. With a clutter of solutions out there, it can be hard to choose the posture training system that’s right for you. In this post, we are going to walk you through what’s out there so that making an informed choice is easy. Posture…another thing you have to keep on top off in addition to your busy schedule, right? Well, not exactly. Proper posture has a lot of different benefits. A few studies have linked good posture to reduced risk of injury. This is especially important if you work in construction, the trades or any other job that requires you to lift, push or pull something heavy. This is because when you have poor posture, the muscles in your shoulders are misaligned, which means that the force of pushing or lifting is not distributed properly. The result – sore shoulders, neck and back pain that can drag on for days, weeks and sometimes months! The effects of good posture don’t stop there! And get this – that’s not all! Not only does good posture make you feel more confident and helps keep you injury-free, but it’s also key in achieving your fitness goals. When you work out, proper form is very important to make sure you are targeting the right muscles, in a way that helps them get bigger. Rounded shoulder, for example, is a very common posture issue where the shoulders are rolled in and the head leans slightly forward with the chin down. Round shoulder gets in the way of proper training of your back muscles. Poor fitness form will leave you sore and with no results to show for it. Even if you start out with good posture, the form will decay if not maintained. We pay personal trainers thousands of dollars to help us achieve good form, but that money is wasted unless you add in proper posture. To sum it up – good posture comes with a multitude of benefits. The biggest question is – how to get there! When looking for a posture training system that’s right for you, there are a number of things to consider, such as your lifestyle, your health needs, your habits, schedule, and budget. Ideally, whatever system you choose should fit into your life seamlessly, because you are building a habit of good posture – habits take time. To be successful, a habit has to fit into the pattern of your life – it should not limit you or feel like a bother! Think about your daily schedule. For someone who wakes up at the break of day, dashes to the gym and then spends 12 hours working, a posture training system that requires you to take time out of your day to sit still may not be a good fit. 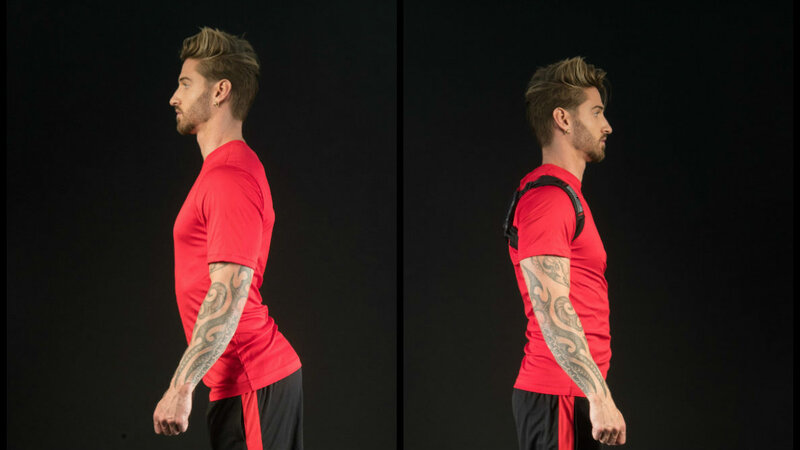 If you are constantly on the move, you need a posture training system that travels with you and allows you to move while wearing it. If you spend a lot of time at your desk, you need a system that helps gently correct your posture for the long-term and one you could wear at the office without raising eyebrows. If you’ve had injuries in the past, or limited mobility, make sure to choose a posture training system that is easy to take on and off. It also helps if your posture training system is easy to clean and stores away without taking up a ton of space. With many digital solutions out there, consider the time it takes to charge a device and the fact that you need a Bluetooth connection and access to power, which might throw off your plans if you miss a charge. If you are working on good posture preventatively your needs are different from someone who is rehabilitating or recovering from an injury. An alternative to posture training systems is physiotherapy and clinical intervention. However, this can take up a lot of time, cannot travel with you and has significant costs if you have limited or no health coverage for these health services. Another thing to consider is the limitations of your health, such as chronic pain, reduced mobility or recent injuries. When choosing a posture training system, it is important to look for a true system – meaning a package of exercises and stretches that together with the posture training device provide a holistic solution. Good posture is all about balance, meaning a lot of elements have to come together, from muscle training to lifestyle. That is why it is so important to choose a system that fits well with your activity levels and health needs. At the end of the day, no matter how good a posture training system may be, if it’s outside of your budget, it’s not an option. Posture training systems range in price from $10 to $250, so there is a lot of choices, but also a lot of confusion – do you always get what you pay for? A good posture training system is made with quality materials that withstand wear and tear. A good posture training system is also flexible and adjustable, meaning it can be adjusted to match your improving muscle strength and give you long-term results. Without that flexibility, you will eventually plateau and will be left on your own to continue strengthening the muscles responsible for good posture. On will-power alone, you risk losing the progress you’ve worked hard to achieve. Look for posture training systems that include comprehensive manuals with tips and exercises for that holistic approach. Non-digital posture training systems should come in a variety of sizes to ensure proper fit. A healthy budget for a posture training system is between$150-$200. This is a price range of quality materials without expensive flair. Chronic back pain plages over 80% of North Americans – not surprising, given how difficult it is to develop and maintain proper posture. Posture training systems set out to fix our bad posture. There are a few categories you should know about. These devices will buzz or shock when a slouch is detected. They are typically small and often have a companion App for your smartphone. The problem is that this posture training system isn’t training your muscles on proper alignment – it just punishes when that alignment is interrupted. Unfortunately, our brains have a habituation mechanism – we will eventually learn to ignore the annoying buzz after a while, bringing you back to square one. Apart from style and flair, these wearables are a good fit for someone who is already in the habit of correcting their posture on their own and just need a reminder now and again. This may not work for people with injuries or those just starting their posture improvement journey. Perhaps the most common, non-digital posture solution, braces vary in price and effectiveness, but their core attributes don’t change. Braces tend to be restrictive and bank on keeping you in a particular position, rather than re-training your muscles and building strength in key posture muscles. Braces do not yield long-term results and are more of a band-aid solution. Physiotherapists and chiropractors may offer exercises, massage, and other pain-relieving measures. However, in absence of a complimentary posture training system, the relief offered by these healthcare practitioners is limited and short-lasting. Not to mention, time-consuming and costly – the visits can add up quickly, especially if your health benefits are limited. This category is perhaps the most effective type of posture training systems, but there are only a handful of reliable brands on the market. Wearable fitness equipment strengthens postural muscles for long-term results. Look for brands that include a training program for lasting health benefits. Wearable Fitness Equipment (like Bladeflex) increases scapular mobility, which can reduce shoulder pain – a special consideration for overhead athletes, like baseball and football players, and swimmers. A posture training system like bladeflex is a low-cost, high-value asset to your body – with adjustable torque your muscles continue to be challenged as they get stronger, giving you long-lasting posture results. Look for posture training systems that are flexible so that they can be worn any time – our clients wear Bladeflex at the gym, in the office (you can wear it under your blazer or sweater), out on errands and at home. Moreover, opt for systems that do not require an extensive time commitment – Bladeflex can be worn for as little as 20 minutes a day, easily fitting into your morning routine. Posture is a valuable body mechanic that we take for granted – until it’s too late. Prevent injuries, increase physical form and performance and boost your confidence and self-esteem by choosing – and sticking to – the right posture training system for you. Look for high-quality, high-value posture training systems that make sense for your lifestyle, schedule, overall health, and wallet. Having tested multitudes of posture training systems on the market (and left dissatisfied), we decided to design our own. Following years of research and development, we created Bladeflex – a wearable posture training system that keeps your muscles working and getting stronger for long-term effects. Choosing a posture training system that’s right for you is extremely important – you will reap benefits from the right choice for years to come.